A huge shark that looks like it was designed by Walt Disney. It has a broad, flat head, short snout, and a huge transverse, terminal mouth almost as wide as a double bed. The shark has prominent lateral ridges. 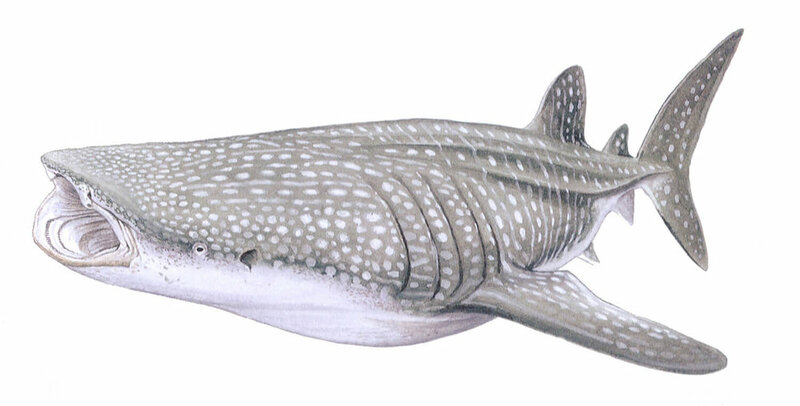 This shark has a checkerboard pattern of yellow or white stripes and spots on grey, bluish or greenish-brown back (white or yellowish underside). At birth, the shark is 1.8-2.1 ft [55-64 cm] in length. Males mature at over 19.7 ft [6 m] while females mature at more than 26.2 ft [8 m]. Its maximum length is possibly between 55.8 and 68.9 ft [17 and 21 m]. Pelagic, open ocean to close inshore off beaches, coral reefs and islands, and surface to more than 2500 ft [762 m]. SRI has deployed satellite tags on a number of whale sharks, and a number of the sharks whale dived to 2500 ft (the maximum depth the tag could record), sometimes several times a day. Circumglobal, all tropical and warm temperate seas except the Mediterranean. Whale sharks are known to divers as “gentle giants” due to their placid nature. SRI has placed visual and satellite tags on more than 800 whale sharks in an effort to discover their migratory routes. Long-distance, long-term migrations are undertaken; the longest so far recorded was 8077.8 miles [13,000 km] (in one direction only) over a 37 month timespan. Tagging and photo-identification of individuals indicate regular visits to favored feeding sites to feed at annual, seasonal, or lunar fish and invertebrate spawning events. The high density of plankton produced on these occasions is consumed by suction feeding and gulping, often while hanging vertically. Whale sharks are extremely vulnerable to over-exploitation due to their gentle nature, and they do not do well in captivity. In 1999, Honduras became the first nation in the Caribbean to legislate protection for Whale sharks. 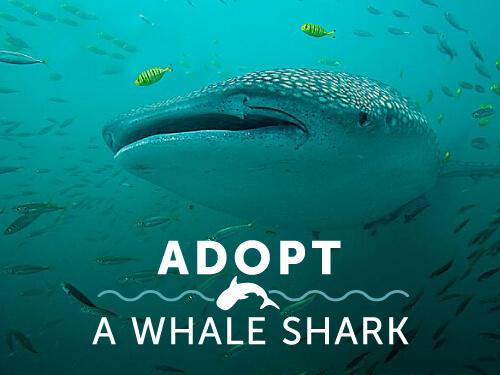 In 2002, Whale sharks received protection by listings on two United Nations Treaty organizations: The Convention on International Trade in Endangered Species (CITES) Appendix II, and the Convention on Migratory Species (CMS), also known as the Bonn Convention.